I made this soup before we left for Christmas. I was looking for something lighter, but full of flavor. Any peanut butter flavored soup tastes great to me, but the addition of the roasted tomatoes and the healthy kale put this at the top of my list. I used the recipe found on Cooking from A to Z in a post which features 3 types of soup. In a bit of oil, saute the ginger, garlic and onion for several minutes. Add diced potatoes and cook for about 10 minutes. Throw in the peanut butter, kale, tomatoes and seasonings (and 5 cups water) and heat to a boil before simmering for 15 minutes. Once potatoes are cooked through, blend or process the soup. I only did about half and left the other half chunky, mixing them together. Season with salt and pepper to taste. Notes: Again, this makes for a great healthy soup! We were invited over to my old roommate’s place for a little holiday dinner before Christmas. We were instructed to bring dessert. I do not bake a lot of desserts so it was a nice excuse to bake something I’d been craving. These chocolatey, peanut buttery, coconut filled bars were a hit. Thanks to The Kitchen Sink for posting this decadent recipe. Chris had about 6 the first night I baked them. Okay, maybe 8. I am posting exactly from her site since it’s the holidays! Preheat the oven to 350. Butter and flour a 9-inch square pan. In a medium bowl, whisk or sift together the flour, baking powder, cinnamon and salt. Set aside. In the bowl of a stand mixer, mix the butter and peanut butter until fluffy. Add the sugar and mix until combined. Add the eggs and vanilla and mix until combined. With the mixer running on low speed, slowly add the dry ingredients, mixing until just combined. Using a spatula or wooden spoon, fold in the chocolate, peanuts and coconut. Bake the blondies in the center of the pre-heated oven for 30 minutes, or until the blondies have just begun to brown around the edges. After Thanksgiving, which was 3 days full of meat, starches and cheese, I was craving vegetables and greens. This recipe from 101cookbooks was just the thing I needed. I adapted it a bit (served on a bed of kale instead of kale mixed in and changed some vegetables), but that’s what this kind of recipe is made for. I know we are headed into the week of Christmas, but just in case you need a break mid-week, this should do the trick. Heat the olive oil in a pan and toss in the onion and the chickpeas. Saute until the chickpease turn light brown and start to get crispy/crusty. Stir in the tofu, red pepper and corn and cook until warmed through. Stir in the lemon juice and zest and season. While this is cooking, quickly blanch a big bunch of kale. Boil water in a big pot and toss in the kale for about 1 minute. Drain and rinse. To serve, plate a bunch of kale and top with the chickpea mixture. Notes: Simple flavors, good texture, very filling and vegetably! I have a couple healthy recipes waiting to be posted, but I just had to post my turkey roasting adventure today. I roasted it yesterday and it was the first turkey I’ve ever cooked. I have to say that rinsing and preparing the raw turkey was gag-inducing. Pulling out the neck and the bag of gizzards … Ick. But I cleaned it up on Friday evening and put it into a big pot of seasoned salt water to brine. Yesterday I roasted it, as instructed by Alton Brown. The bring I kind of made up myself, but the roasting instructions I followed off this recipe. As I had hoped, the turkey browned nicely, smelled amazing, was cooked to the perfect temerature and was all around ‘mmm’ worthy. My brother and sister-in-law came over to enjoy the turkey and got to watch me attempt to carve this thing. Marti took the pictures for me! So, if you are planning on cooking a turkey for Christmas, or just for giggles, I highly recommend the brine! To brine the turkey, start by boiling about 3-4 cups water with the salt, sugar, and spices. Pour this mixture into a big pot (that your turkey will fit into) and add some ice to cool it, then more cold water along with the turkey. Make sure to clean the turkey first by pulling out the neck and gizzards and rinsing well! Put a lid on and put into the fridge for 1-2 days. On the day you cook the turkey, take the bird out of the brine and rinse well. Pat dry with paper towels. Stuff the turkey with onions/apples/lemons or just onions. Coat liberally with vegetable oil. Heat oven to 500 degrees. Place the turkey on a roasting pan or get creative and use a cooling rack and a cookie sheet, like me. Roast the turkey for 30 minutes at 500 degrees and then turn the oven down to 350. The turkey should cook for 2-2.5 hours. Use a meat thermometer to check the temperature. The turkey is fully cooked at 151 degrees (make sure to check the thickest part of the turkey breast). Let sit for 15 minutes, covered with a big bowl or tin foil. Carve your turkey, carefully, and enjoy. Please note that the turkey will oose liquid when you are carving and it will go all over the counter. Try to prepare for that. Notes: I liked roasting this turkey. I will like all the left over turkey sandwiches too. Servings: No idea. So many servings! I am learning a lot about lentils. There are so many kinds of lentils! I’ve cooked with brown, red and green lentils so far, but am always looking for the much talked about French lentils (puy lentils). Lentils are fast cooking, unlike dried beans which need to soak and cook for an hour plus and are great for vegeterians as they are high in protein (and iron and fiber!). But I mostly cook with them because they taste so darn good. 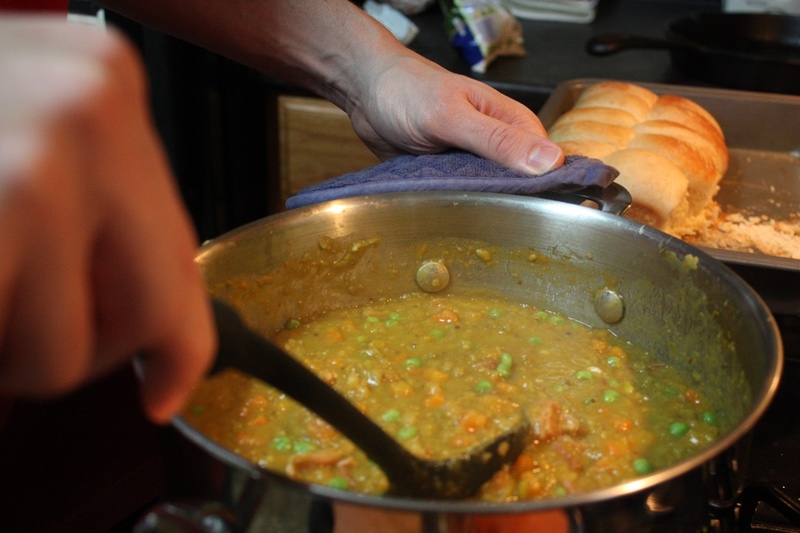 This red lentil soup came from SuperSpark’s blog. In a large pot, heat 3 tablespoons oil over high heat until hot. Add onion and garlic, and sauté until golden, about 4 minutes. Add broth, 3 cups water, lentils and carrot. Bring to a simmer, then partially cover pot and turn heat to medium-low. Simmer until lentils are soft, about 30 minutes. Taste and add salt if necessary. Using an food processor (or immersion blender if you are so lucky) purée half the soup then add it back to pot. Soup should be somewhat chunky. Reheat soup if necessary, then stir in lemon juice and cilantro. * I accidently added two cups of red lentils into the pot and then saw it only called for one cup. Oops! Then I added more water, tomato paste and spices. It still turned out great but would probably have been more flavorful if I had been able to add broth instead of water (I was out of broth). Simple, easy and filling. 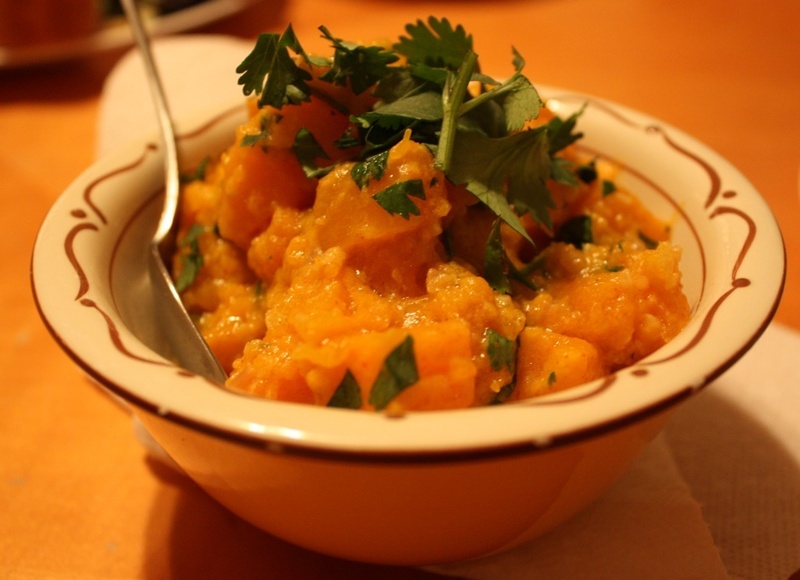 This butternut squash recipe, from Mark Bittman’s How to Cooking Everything: Vegetarian, was a nice entree but is probablly better served as a side. I think we had this along with a fresh green salad and maybe warm bread or wraps. It’s been a few weeks! Saute the garlic, ginger and chili in the oil in a deep skillet. After a few minutes, add the squash and coconut milk. Bring to a boil, cover and turn heat down to low. Cook, stirring a few times, until squash is tender, about 15 minutes. Uncover the pan and raise the heat to medium-high. Cook until all the liquid is evaporated and the squash begins to brown, about 5-10 minutes. Serve with fresh cilantro. Chris has been learning how to put together some soups this winter. 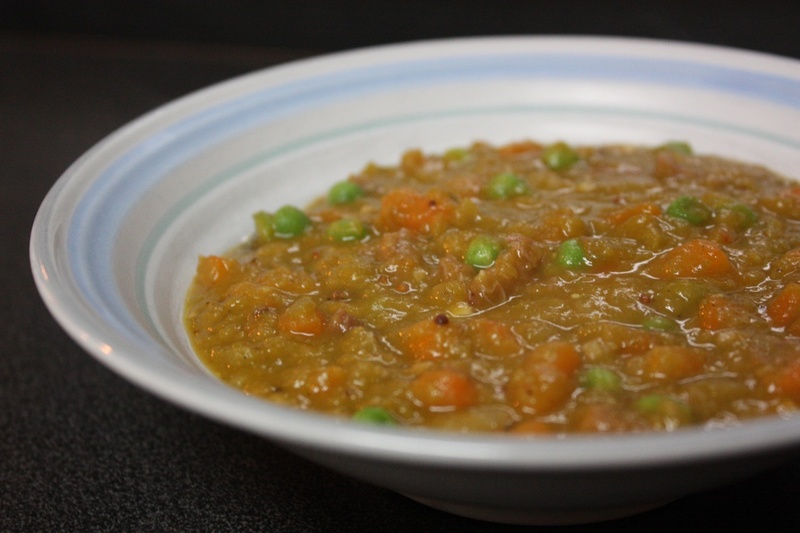 This split pea soup with ham is his second recipe and it turned out really great. It’s a simple enough recipe and is delicious with a big ham bone to flavor it all. I found the recipe on Closet Cooking and didn’t stray too much. With a wind chill of negative 4 this morning, I figure it’s a good time for a nice, hearty soup recipe just in time for the weekend. In a big soup pot, heat the oil and toss in the onion and carrots. (When I say heat the oil, I normally mean to a medium heat. Just FYI for those, um, new cooks.) Let them cook for about 5 minutes until tender, then add in the garlic and saute for a few more minutes. Rinse the split peas and pick through to pull out any bad peas or rocks that got in there. Once cleaned, add to the pot along with the broth, ham bone, herbs and seasonings. Bring to a boil and then turn down heat to a simmer (slow and even little bubbles between low and medium heat). Simmer for two hours. Your split peas should turn to mush by the end. Pull out the ham bone and cut off all the ham. Dice the ham and toss the bone. Add the ham back in along with the frozen peas. Stir until all is warm and you start to drool. Serve and enjoy the leftovers later. Notes: The frozen peas aren’t needed, but I like the extra little something they add. This soup made our apartment smell heavenly.